No, but we should keep the terrain different in some way. There's only so many ways we can do so. While it's good to try to shake up the bottle here and there, we don't want to pull a Miyamoto and only do it for the sake of having something different, when things we already have on the plate would work and fit better. Since we want to offer a new form of exploration, shouldn't we avoid floating islands since going from island to island is already an End thing? I really don't get everyone's obsession with floating islands. We have a dimension that is a cave (the Nether), and we have a dimension that is floating islands in a void (the End). We should come up with something different for this dimension. I understand that it's hard to do something that hasn't been done before, but that isn't an excuse to re-use a terrain features, even if they're modified. Also, having non-flat floating islands seems kind of weird. A real space dimension wouldn't have a dragon. A real space dimension would have at least 1 floating mob (besides the ender dragon). A real space dimension wouldn't have so many teleporting mobs. Teleporting does not have anything to do with space. Finally, a real space dimension wouldn't require you to get hit by a crystal following you to alter gravity at all. What does a real space dimension have, then? I'm glad you asked. First of all, a real space dimension would make you be able to jump much higher. Also, sand and gravel would fall faster. I also imagine a real space dimension having floating asteroids all over the place (made of rock). Not like the end islands. These would be floating in the middle of the air and would not be meant for living on. In fact, if you fell on it or jumped into one, the entire thing would fall apart and each individual block would drift into the distance. A space dimension would be more of a map of many different dimensions. The point of the dimension would be to do parkour on these asteroids and floating blocks in order to get to a planet (you start near the earth). Planets are giant cubes, much like the depiction of the current minecraft world. They spawn randomly, made of either end stone, red sand, concrete, etc. Once you get close enough to a planet, you are pulled toward it until you reach the surface. Once you reach the surface, the planet loads like the overworld, only with severely altered terrain. The entire planet would act as 1 biome in a sense that the entire planet has similar mobs and terrain. Planets would have their own mobs and structures, much like biomes. A village would have aliens instead of villagers. Other obstacles inside space would be moons and suns. Moons move around planets and can be used as part of the parkour once you run out of asteroids. Suns spawn near planets. Once you get within a certain range of the sun, you will burn up. The distance between the planet and the sun will determine things like sun size, amount of precipitation, which mobs spawn, and amount of snow on the surface. To leave a planet (including earth), you must propel yourself up to a certain height at a certain speed. The easiest way to do this would be with elytra (and fireworks) or a TNT cannon. While we've been relentlessly arguing about the frost dimension, space has tied frost on the poll. Personally, I feel like the End already captures the space vibe. Sure, if does have asteroids, planets, or full on aliens; but it still looks an awful lot like the moon. Having a space dimension would conflict which the color pallet and potiential theme of the End. A frosty ruined city with a hint of steampunk does it conflict. Huh. What if we made the method of getting to the dimension involve space? The Prehistoric Dimension & Ruined City have also come in second. I feel like those could work together, but how the heck could be incorporate prehistory into space? Then again, we don't have to, since it has come in second. I love the idea of an ice dimension in Minecraft. The "shape" of the dimension is an entirely different story, though. Depending on when the player reaches the dimension will be the main deciding factor. If you could reach the dimension after fighting the dragon, the dimension could be very mountainous, to take advantage of the Elytra. Imagine flying around massive ice spires at max speed. 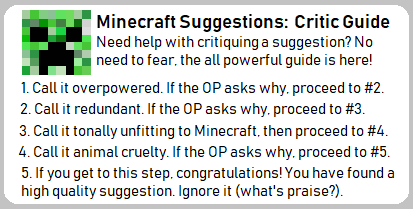 The galacticraft mod would seem similar at first glance, but there are a few things that are different about my idea. Galacticraft uses an actual map to transfer between a limited number of dimensions, whereas my idea automatically generates dimensions inside of 1 big dimension. Galacticraft requires a spaceship, spacesuit, and more to go into space. While that is very realistic, It makes the space dimension(s) harder to get to. My idea uses a simple way to get into space, and then a parkour challenge to get from planet to planet. Galacticraft lacks variety in the planets they have. They are all basically the same, except made of something else with a different boss. My idea allows for great alterations, including terrain, sun size, and precipitation. Galacticraft is a mod. That means that it is not available to you unless you know about it and trust the site you're getting it off of. Including this in the original game would make it available to many more people. It might also draw more people to play the game. 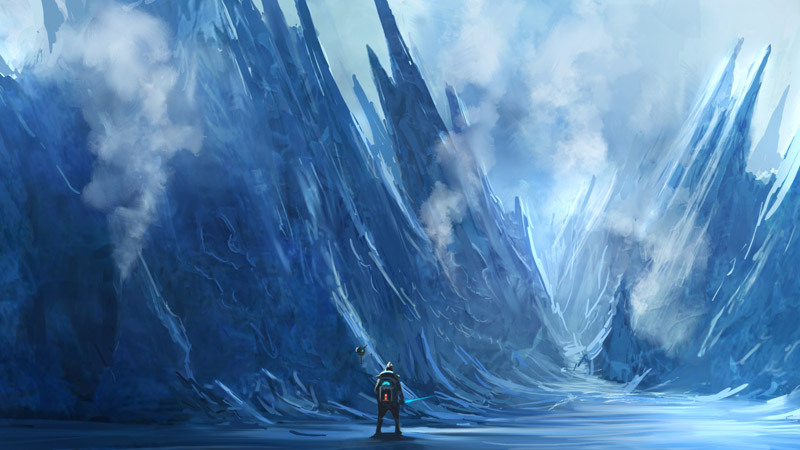 An ice dimension, however, is already part of the game (as a biome) and does not have much potential for variety. 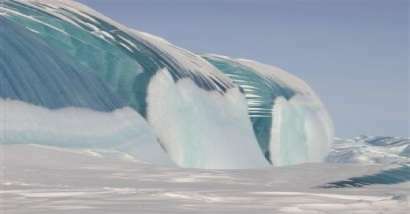 We all know there is already an ice spikes biome. We're talking more about crystals rather than ice spikes, and the terrain generation is something that will most likely be completely alien (though it's still up for debate). You [fishg] should probably change the poll to Space vs Frost Crystal dimension. Just those two. Then, after we've figured out which one we're doing, you could change it to Ruined City vs Prehistoric vs Neither. We can get to world generation later. Right now we need to decide between space and frost. Both suffer from the fact that each have been partially implemented already in the game. 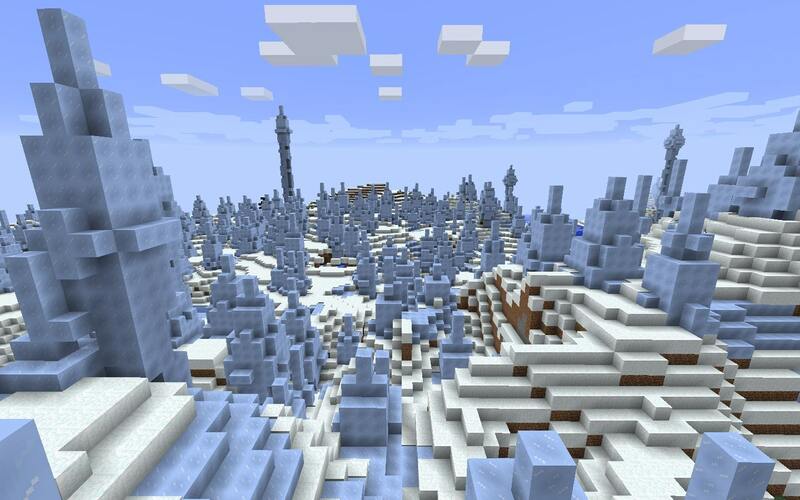 Frost, as stated before, is very similar to the ice spikes biome. While we could do something "very different" terrain wise, it would still be compared to those biomes. This is one of the reasons I'm on "team floating islands"- it needs to have a distinctive feel. The exact same goes for the Space dimension. Space is the most obvious dimension on this list. There's only one problem- the End. If we went though with the Space dimension, would it really be that different from the End? Out of the two, I'd say Frost is more unique. But that's just my opinion. ...What makes the End space? I don't recall seeing any stars, planets, comets, asteroids, nebulae, spaceships, or any of that stuff in there. This "being too similar to xyz" crud needs to be dropped. Almost 2 pages have been wasted on getting jack squat done in a vicious loop. If it works, it works. Also, I don't really see how because a single biome, that if I may add, is rare, and just because it has spikes here and there, is "too similar." Frost and Space work just fine. You just have to use your imagination. I agree. I honestly just think the transportation between islands (if floating islands were done) would be a little boring. If we are to make the dimension with floating islands, how are we to ensure that traversing the dimension is not uninteresting? We could combine the low gravity effect that someone has suggested with floating islands of various heights for very interesting "parkour", if it could be called that. I don't really see how because a single biome, that if I may add, is rare, and just because it has spikes here and there, is "too similar." The point of a dimension is to be different from the world. If this single biome looked like what was being described as an ice dimension (which it did), it would not add any variety into the game except for the fact that you can now see that biome more often. But, it has come to my attention that this new dimension would not resemble that biome much, so I have brought that (sub)discussion to an end. It would appear that Frost has one in the poll (sorry Ptolemy2002). But this doesn't mean we can't borrow concepts from the space idea for our dimension. Right now it seems to be a bit of a melting pot already. For the frost dimension, what if it was inhabited by one block tall "ice men". Imagine the snow monster from Frozen, but smaller and made of ice. They could live in villages and trade, or be the "zombies" of this dimension. I'll leave the poll open for a couple of days, just in case space makes a comeback. Until then, we should continue posting ideas for either dimension. Just remember frost will most likely be the option we go with. Though, of course, the model would have to be simplified if it were to be that small, so that it doesn't have too much detail per size compared to other mobs. I actually really like the idea of these, though. Not really as NPCs, but as little zombies. They could hide in ice and maybe snow layers, and jump out to attack you.